Chuck Hagel speaks Thursday during his Senate Armed Services Committee hearing. Photo by Andrew Harrer/Bloomberg via Getty Images. Welcome to the other side of the dais, Chuck Hagel. The former Republican senator from Nebraska faced a barrage of tough questions Thursday, mostly from GOP members of the Senate Armed Services Committee, who took aim at Hagel’s past comments and votes on Israel, Iran and nuclear weapons. But the most heated exchange came early in the nearly eight-hour hearing, when Sen. John McCain, R-Ariz., pressed Hagel on whether he was wrong to oppose the surge of U.S. troops into Iraq in 2007. “Were you correct or incorrect when you said that the surge would be the most dangerous foreign policy blunder in this country since Vietnam?” McCain asked. “I’m not going to give you a yes or no. I think it’s far more complicated than that. 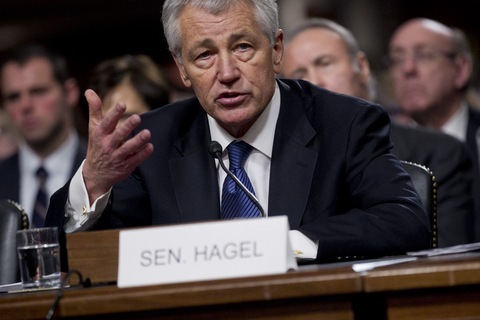 As I have already said, my answer is, I will defer that judgment to history,” Hagel responded. That did not sit well with McCain, who said the failure to give him a clear answer would be a factor in his consideration of Hagel’s nomination, despite the two men being former close friends and Vietnam War veterans. The hours of grueling questions appeared to have little effect on Hagel’s prospects for confirmation, however, with Democrats on the panel pledging their support. Sen. Richard Blumenthal, D-Conn., acknowledged it was a “tough, grueling day” for Hagel but said he saw “no shifting of votes from supporters” following the hearing. Sen. Mark Udall, D-Colo., also signaled he would back Hagel. “Without question, Chuck Hagel will bring his remarkable experience as both a combat veteran and an outspoken Senate leader to the Pentagon,” Udall said in a statement. In contrast, Republicans announced their opposition to President Obama’s choice. Sen. Marco Rubio, R-Fla., said he intended to vote against Hagel, citing the former senator’s views toward Cuba, Iran sanctions and past comments regarding support for Israel. “After carefully reviewing Sen. Hagel’s record on a number of issues, I cannot support his confirmation as our nation’s next secretary of defense,” Rubio said. Sen. John Barrasso, R-Wyo., meanwhile, declared that Hagel “appeared weak and wobbly” in his testimony before the committee. An administration official said the combative nature of the hearing did not come as a surprise for a nominee who has faced more sustained and personal opposition than any of Obama’s Cabinet picks. “There’s no indication that this is peeling off any support that was there before today,” said the official, who spoke on the condition of anonymity to discuss the administration’s internal assessment of the hearing. Democrats hold a 14 to 12 advantage on the Armed Services Committee. As long as Hagel maintains Democratic support, his nomination will move forward to the full Senate, where Democrats have a 55 to 45 margin in their favor. So far only one Republican senator, Mississippi’s Thad Cochran, has said he will vote to confirm Hagel. Former Vice President Al Gore visited the NewsHour on Thursday to discuss his new book, “The Future: Six Drivers of Global Change.” Jeffrey Brown led the conversation to the other reason Gore’s name was recently in the news: the sale of his television channel Current TV to Al-Jazeera, which is backed by Qatar’s ruling family. “How can you, telling all of us that it’s important to think about cutting back on our energy use, how can you sell to a company that really is backed by that very thing?” Jeff asked. In particular, Gore cited Al-Jazeera’s attention to climate change — his signature issue and one that he won an Academy Award and Nobel Peace Prize for — as a major reason the Middle Eastern network sets itself apart from other news channels on American television. Gore continued the climate change conversation in a second interview for our website. “The public is lulled into an acceptance of going along with this policy of using the atmosphere as an open sewer,” he told Jeff. A poll released Thursday by the Pew Research Center finds that a majority of Americans do not trust the federal government to “do the right thing” or to protect their personal rights and freedoms. Only 20 percent of those surveyed said they were content with the federal government. The federal system, however, is not being blamed by most; instead the elected members are failing, according to this public opinion poll. To discuss these findings, Andrew Kohut, founding director of the Pew Research Center for The People & The Press, joined Judy Woodruff on Thursday’s NewsHour. Kohut put these numbers in historical perspective. He said trust in the government has consistently fallen since the late 1960s. However, this is the first time that a majority of people (53 percent) said their individual rights are being threatened by the federal government, he said. Kohut cited recent discussions on gun control and the Obama administration’s Affordable Care Act as potential factors for this development. Gridlock and lack of action also may contribute to keeping public opinion of the federal government epidemically low. The U.S. economy added 157,000 jobs in January, but the unemployment rate edged up to 7.9 percent. The Bureau of Labor Statistics also reported upward revisions to the jobs numbers from November and December, with a combined 127,000 more positions added than previously thought. Vice President Joe Biden traveled to Capitol Hill on Thursday to urge Senate Democrats to support the administration’s gun safety agenda. Mr. Obama said goodbye to his jobs council on Thursday. White House press secretary Jay Carney said the administration would replace the group with a “new, expanded effort” to reach out to the business community. Republicans, meanwhile, marked the occasion by blasting the president’s economic record. “Whether ignoring the group or rejecting its recommendations, the president treated his jobs council as more of a nuisance than a vehicle to spur job creation,” said Brendan Buck, a spokesman for House Speaker John Boehner, R-Ohio. National Rifle Association President David Keene predicted Thursday that legislative efforts by those seeking to restrict certain firearms or limit number of rounds in a magazine will not succeed. “They hope that they can use emotion to achieve an anti-firearms agenda that they haven’t been able to achieve in the past,” Keene told reporters at a breakfast hosted by the Christian Science Monitor. “People are smarter than politicians, and common sense ultimately prevails. Rolling Stone’s Tim Dickinson walks readers through the NRA’s evolution from a gun owners group to one that represents gun manufacturers. Beyonce wants you to know she can sing the National Anthem. Any questions? Friday’s tidbit from NewsHour partner Face the Facts USA looks at the American auto industry’s growth since the recession — and its slow increase of jobs. You can watch Hillary Clinton’s final speech as secretary of state. Watch for analysis Friday morning from economics correspondent Paul Solman on the jobs report at pbs.org/newshour. NewsHour production assistant Ellen Rolfes examines the “Sandwich Generation” and the grown children they must continue to support. Gwen Ifill looks at three instances of high drama in Washington this week — and the potential implications for the country. NewsHour desk assistant James Hercher previews the fight for passing a gay marriage bill in the Rhode Island State House. A PPP poll out Thursday found voters in the state strongly support legalizing gay marriage, 57 percent to 36 percent. We’ve got the roundup of your favorite Super Bowl commercials of all time. Betty Ann Bowser looks at the dangers of energy drinks. Odd that pork and Jews are the two main topics of the Hagel hearings. If nothing else, Romney campaign efficient about closing out its books. Ended year with $383K cash on hand and just $825K in debt. Christina Bellantoni, Cassie M. Chew and Sarah McHaney contributed to this report.